I find it tragic and heartbreaking that the people who feel rejected the most often refuse to take the steps necessary to stop feeling rejected. Have you ever noticed that? So what’s the deal? Is it because they enjoy being how they are? These same, precious people are the ones whose hearts are broken. They do not enjoy feeling rejected. They may not even be rejected in reality at all. Nevertheless, the whole reason they feel that way is because a spirit of rejection is hounding them. It never lets them out of its grip, so they always sense that rejection everywhere they go. Likewise, I believe the reason that they so often don’t take the steps necessary to break through is because that same spirit of rejection wants to keep them isolated. It can be a vicious circle. You may have noticed this in your own life. Maybe someone you know really does care about you and is trying to love on you. But you feel rejected everywhere you go, so you either avoid the people who really do love you, or you keep them at arm’s length. You would rather keep rejection around than let people truly love you. You refuse to let people who really do love you get close to you. You keep them at arm’s length. You also refuse to do the things that would set you free, once and for all, from rejection. But it doesn’t have to be this way. Things can change for you, right now, today. Things can become different than they ever have been before. Why? Because WHO YOU ARE is not rejected. Abandonment and rejection don’t just go away. They have to be healed … but healing is easy when you learn what to do. Sign up for free email updates and receive my free 7-day mini-course, How to Heal from Rejection, by email! It’s my gift to you when you confirm your subscription. I’m in! Send me the e-course! We won’t send you spam, and you can unsubscribe anytime you want to. The truth is that there is a God in Heaven who loves you outrageously and sent His Son to die for you. The truth is that you are are accepted in Christ Jesus. If you have made Jesus Christ the Lord of your life, then God Himself has accepted you. He has adopted you and made you His own. 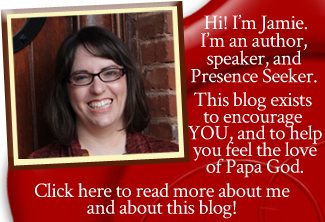 REALITY is that you are Papa’s beloved child… even if you don’t feel like it. He planned your birth. He placed you on the earth for such a time as this, and you can walk in the reality of His acceptance everywhere you go and around everyone you encounter. Don’t you want to live out of that reality? Yes? Did you say yes? If you said yes, you can be free. I blogged about some of the steps to getting free here, in When You Don’t Feel Loved, God Still Loves you. I also wrote about more of the steps here in Removing Shame, Restoring Honor part 1 and part 2. Are you willing to DO what it takes to break your allegiance to the spirit of rejection, and walk in your true identity as a beloved son? This is the crux of the issue. You have to DECIDE. You have to decide to ACT. You have to decide that you’re not going to keep the nasty demon of rejection around anymore, as if it were your best friend. You have to acknowledge that you know God’s truth and you are going to do what it takes to experience it in your own life. This is going to take ACTION. You have to renounce the spirit of rejection. You have to ask the Holy Spirit to fill you up where the spirit of rejection was. You will have to soak your mind in truth. You will have to listen to, read, and receive solid, Biblical teaching. You will have to pray about it, depend on the Holy Spirit for guidance, and ask the Lord to help you. If you have allowed the accuser of the brethren to build a stronghold of wrong thinking in your mind, it’s going to take work to retrain your mind. You have to literally recondition your mind to dwell on the truth, instead of on the lies the enemy has planted therein. You can break your allegiance to rejection today. But it takes a decision on your part. Are you ready to make that decision? Do you want to be made well? Will you stop going around and around this same, dumb mountain? Don’t let the spirit of rejection keep you rejected. Decide that you WILL have everything Jesus died for you to have, and you will live the abundant life Jesus came for you to live. This was me. I didn’t know what it was called or that Jesus was the answer until I crawled through the doors of AH into their deliverance ministry. Out of despondency and desperation one day, I cried out to God and told Him that something had to change or to please just let me die. He heard me and told me what to do. The ball was in my court. I had to choose and with His help, I chose life that day. In the words of Joyce Meyer, “I’m not where I need to be, but thank God I’m not where I used to be!” I still battle rejection, inferiority, and the like at times, but I have THE solution today. His name is Jesus. Each day is better as I wash my mind in the Word and keep looking to the One Who bought my freedom. I desperately needed this today . 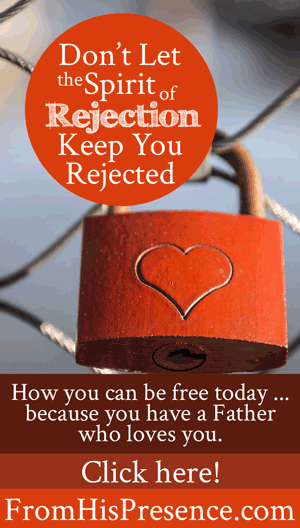 About a week ago, God brought me a bible study on rejection and showed me it is the root lie of so many of my issues . This email was perfect timing and confirmation this morning that I don’t have to struggle with this. Satan loves to make me think I can’t have freedom from the past things I’ve done and I always have to live in this mental cycle of shame and rejection. What a blessing that God offers freedom no matter where we’ve been. Jennifer, no shame. God never puts shame on His people and He hates shame so much that He promises that, if we’ve been shamed, He’ll give us double honor instead. (Isaiah 61.) I pray for that double honor for you today in Jesus’ name. The devil is a liar. As soon as l experience some sort of joy in my spirit, then certain issues crop in my mind then guilt and fear grips me. I trust the holy spirit will help me to overcome . Lord, deliver Freda’s soul and help her to take every thought captive to the obedience of Christ! Holy Spirit, overshadow her today with so much hope and comfort and encouragement that Your JOY wells up in her like an ever-flowing river and let her never be without joy again a day in her life! In Jesus’ name! The spirit of rejection is always making me feeling rejected. I try to fight it, but it’s not always easy. I’m glad we got to talk about this, Rafael. How are you doing on your homework? I’m praying for you. I’m doing great but it’s not completed. Thanks for the prayers. Could you send some scriptures? Hi Joe. I’m so glad you stumbled onto this too, because I believe it was for a purpose—that God wants to heal you from that rejection. For Scriptures, just google “Scriptures about being accepted” and you will find a ton of them. The key to healing is forgiving ALL the people (individually is best, I believe) who 1) abandoned you and 2) rejected you. You will find massive freedom when you do. I wrote an article about how to do that here, part 1 and part 2. Welcome to ask if you have questions! But you can totally do this. If you invest the time into your healing, you will see massive results. The oppression will feel a little bit lighter after each person you forgive. I see this every time I work with someone in deliverance/inner healing. PAPA GOD is faithful, and He’s faithful to heal and deliver and set free every time. Call on Him as your Wonderful Counselor and let Him help you through! Thank you so much for reading my blog! Have a great day! I just found this article for the first time. I have been rejected so many times, I pray that God helps me to remember them all so that I can forgive them individually. My husband left me in July, and is seeing a woman who is also married. He’s not saved. I’m having a horrible time, and also feel very rejected. I also just found out my cat has an advanced stage of cancer. I want to kill myself. Hi Whitney, I’m sorry you’ve been going through such an awful time. But Father God loves you so much and is with you right now. He didn’t do these things to you, but He’s ready, willing, and able to heal and restore your life and make everything new again–and BETTER than it ever was before. If you will cry out to Him and give Him your burdens and your cares, He will begin to work in your life to heal your heart and circumstances. Much love to you. I pray: Father God, in the name of Jesus, I rebuke the spirit of death and suicide off my sister Whitney and I release Your life in Christ Jesus into her. I bind her to You, Jesus, and I pray that she would come to You right now, for she is weary and heavy laden, and You will give her rest. Help her, Lord. In Jesus’ name, amen.